President Donald Trump meets with Canada's Prime Minister Justin Trudeau in a bilateral meeting at the G7 Summit in Charlevoix, Quebec, on Friday. 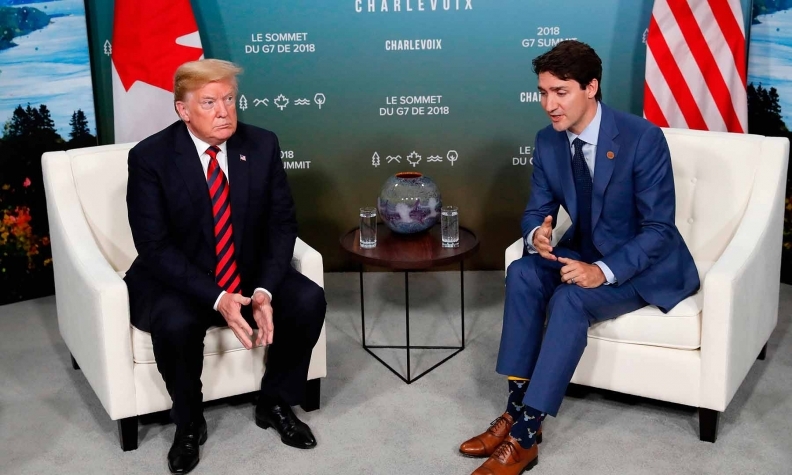 LA MALBAIE, Quebec -- President Donald Trump on Saturday threw the G7’s efforts to show a united front into disarray after he became angry with Canadian Prime Minister Justin Trudeau, and said he might double down on import tariffs by hitting the sensitive auto industry. Trump's bombshell announcement that he was backing out of the Group of Seven communique, made after he left the summit in Canada early, torpedoed what appeared to be a fragile consensus on the trade dispute between Washington and its top allies. "PM Justin Trudeau of Canada acted so meek and mild during our @G7 meetings only to give a news conference after I left saying that, 'US Tariffs were kind of insulting' and he 'will not be pushed around.' Very dishonest & weak. Our Tariffs are in response to his of 270% on dairy!" the U.S. president tweeted. In his press conference, Trudeau had spoken of retaliatory measures that Canada would take next month in response to Trump's decision to slap tariffs on steel and aluminum imports from Canada, Mexico and the European Union. "Canadians, we're polite, we're reasonable but we also will not be pushed around," Trudeau, the host of the two-day summit in La Malbaie, Quebec, told reporters. “Based on Justin’s false statements at his news conference, and the fact that Canada is charging massive Tariffs to our U.S. farmers, workers and companies, I have instructed our U.S. Reps not to endorse the Communique as we look at Tariffs on automobiles flooding the U.S. Market!” Trump wrote in another tweet. Reacting to Trump's tweets, Trudeau's office said: "We are focused on everything we accomplished here at the summit. The Prime Minister said nothing he hasn’t said before - both in public, and in private conversations with the President." Flavio Volpe, head of the Canadian Automotive Parts Manufacturers' Association fired back on Twitter. "So.... you’re suggesting using a National Security regulation to charge $8B in tariffs to *American* consumers who buy 1 million cars made by American automakers, containing 60% American parts content, because of the price of milk in Windsor? Where do I start?" Volpe responded. Trump's salvo capped a dizzying two days of controversies that began with his suggestion Russia be readmitted to the G7, then what a French official described as a "rant" full of "recriminations" against U.S. trading partners, followed by Trump's denial of any contention with leaders at the summit and his description of their relationship as a "10." The communique, which appeared to have papered over the cracks that have surfaced in the G7, said the leaders of the United States, Canada, Britain, France, Italy, Germany and Japan agreed on the need for "free, fair, and mutually beneficial trade" and the importance of fighting protectionism. Trump's reversal, announced while he was en route to Singapore for a meeting with North Korean leader Kim Jong Un, sent his G7 partners scrambling. "We stick to the communique as agreed by all participants," a European official said on condition of anonymity. Trump's counterparts in the G7 had sought this week to try to find some semblance of consensus with Washington on trade and the other key issues that have formed the basis of the 42-year-old grouping of industrialized nations. French President Emmanuel Macron had labeled the summit a success before Trump's Twitter posts, saying there was relief within the G7 that an escalation of the trade dispute had been avoided. "The nature of the debate we had was rather appeasement and it stopped the escalation in terms of behavior,” Macron, who had exchanged terse Twitter messages with Trump in the run-up to the summit, told reporters. Macron is aware of the latest twist on the communique and does not have a comment at this time, a French presidential official said. Trump says his tariffs are meant to protect U.S. industry and workers from unfair international competition as part of his "America First" agenda. Trump has announced tariffs of up to $150 billion on Chinese goods over U.S. complaints of Beijing's trade practices and its alleged theft of U.S. technology. China has vowed to retaliate in equal measure. Earlier on Saturday, Trump told reporters it would be "very easy" to make the case for tariffs on auto imports using the rationale that they threaten national security. "It's economic. It's the balance sheet. To have a great military, you need a great balance sheet," he said.